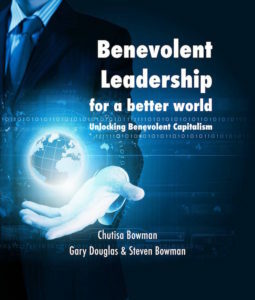 What does benevolent leadership mean? The original meaning of the word benevolent comes from the Latin ‘bene’ and ‘volent’ which together mean “wishing well for all”. In other words it is about being willing to be aware of what one’s actions create for everyone. We can be benevolent leaders in our personal lives as well as in our relationships and family. We can choose to be benevolent leaders in any other area of life, be it at work or in our various communities. A benevolent leader is aware of what is going on around her and recognizes that she is the creator of everything in her life. A benevolent leader asks what it will take to create more in the world and for everybody, not just himself. A benevolent leader is pragmatic, has a generosity of spirit and looks at the different futures that can be created based on an awareness of unlimited possibilities. A benevolent leader functions from awareness, not from conclusion to create a sustainable future for the planet and the people. The last two points require the ability to step outside of our contextual reality. What does that mean? We look for the reasons why something is happening to us, around us or in the world which puts it into the context of what we call reality. It is a level of consciousness we have, that the world functions from. Being a benevolent leader is becoming a catalyst for change, for a different world. We begin to look at a different way of being in the world, both as an individual as well as a business in order to have sustainability. We are willing to develop a strategic awareness to deal with possible future scenarios. This means being willing to perceive where we will end up if we continue the way we have operated up to now and where we could be if we are willing to perceive and implement possibilities. One way to do this is to ask a question like: Where will my life / my family / the world / the planet be in 5 years if I choose this? And again with … if I don’t choose this. There is no way for us to have a cognitive answer to that question. We can sense, though, the energy that comes up when asking that question. Is that energy contractive, heavy or expansive, light? Choosing what is expansive for you (not necessarily for others) will inevitably lead to you creating more for all. In conjunction with a visioning process, I explore this theme in more depth. Currently, this can be on an individual basis in order to create a more fulfilling life or for a small business. I have a Facebook Community that I started some time ago. I have taken several courses with Steven and Chutisa Bowman, world-renowned consultants to Boards and am part of their movement. Contact me and let me know if you are interested in finding out more so we can set up an initial consultation. At the moment, I offer introductory workshops which give an overview of what Benevolent Leadership is and allows for time to ask questions. Usually, they are a combination of Benevolent Leadership with subject areas such as personal and family life, small business, or the earth. Let me know if you are interested in private sessions.